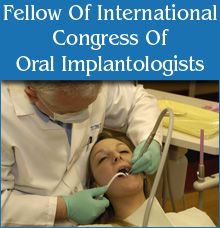 Philadelphia dentist, Dr. Stephen Wilfred is a Fellow of the International Congress of Oral Implantologists. He has extensive training and experience in helping Philadelphia area patients replace missing teeth with dental implants. Dental implants are a great way to replace a single tooth, several teeth or all your teeth with a fixed solution to having removable partial or complete dentures. Implants provide excellent support and stability for these dental appliances. Contact our Northeast Philadelphia dental office today @ (215) 725-4564 to schedule a consultation with Dr. Wilfred for dental implants.